It seems like I just got my Canon 7D. I am still uncomfortable using many of its features. I bought the camera two years and it’s just about to record its 10,00th image. The internal counter will turn over and the begin numbering at one very shortly. This would most likely not cause any problems, because any duplicate filenames would be in separate folders and shot on different dates. And besides, this is my second Canon DSLR, and there are already duplicate numbers somewhere in my computer already. But just the same, I decided to change the filename of the images as I upload them into the Organizer. 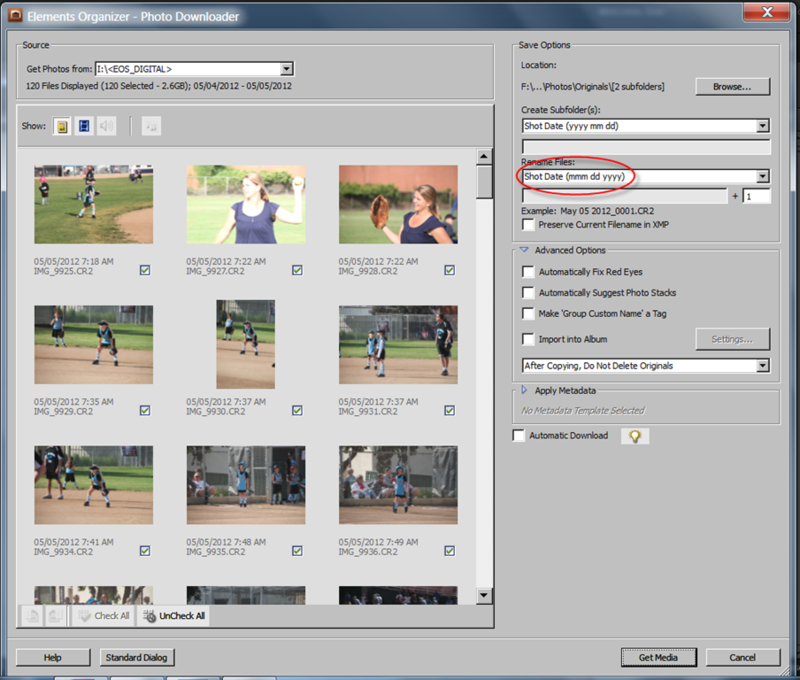 As they are copied to the computer, PSE will change the filename to the shot date plus a sequential number. For example, the tenth picture I would take today would be renamed to “May 13 2012_010.CR2” as I upload it using the PSE’s Organizer, assuming I am shooting RAW images. I changed the associated preference in the Organizer to rename the files automatically by clicking on Edit > Preferences > Camera and Card Reader. Below shows the dialog box I now see while uploading images from my camera. Notice in the figure, I have left the “Preserve Camera Filename in XMP” is left unchecked. I may change this later. I am not exactly sure what would happen when I upload JPEG images or video clips, if I were to check this box. I did not want to have an extra (though very small) XMP file created just to hold the camera-assigned filename. RAW files already are generated when RAW files are uploaded.